There’s so much to do at Mead Open Farm, whatever the weather! 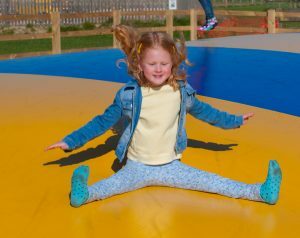 As well as all the animals, the Farm has two huge jumping pillows, an adventure playground, climbing wall, high ropes course (Open Feb- Oct), Go-Karts and Crazy Golf, as well as a fantastic sandpit called Digger Village. 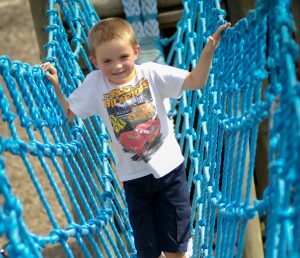 Enter a land of treetop towers, wibbly wobbly bridges and long slippery tube slides at Mead Open Farm’s fantastic Topsy Turvy Towers Outdoor Adventure Play area! Ideal for hide and seek or just climbing, sliding and clambering, it provides the perfect place for children to have fun and be active! With a separate area just for under 5’s, there’s entertainment for all ages, and plenty of picnic tables for the grown-ups to keep a watchful eye out while enjoying a hot drink and snack from The Grain Store Kitchen or a picnic. It’s all included in the entry ticket too! Just like all the other activities at Mead Open Farm, John Deere Go-Karts is included in your entry fee at Mead Open Farm: making days out with us amazing value. Always popular, our outdoor John Deere Go-Karts are great fun! Put yourself in the driving seat and race your family, friends and new friends too! (Height restriction applies.) 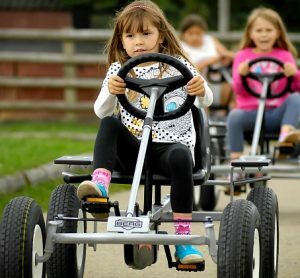 Please note: Monday to Friday during school term-time, the Go Karts are open at 4:00pm – 4:30pm only. Boiiiing! Be prepared to get bouncy on our two gigantic jumping pillows. Mead Open Farm have two brightly coloured, fun-packed, inflatable pillows where children of all ages can bounce to their hearts content. With one pillow just for under fives and one for older children everyone can join in the fun at their own pace! Children will love seeing how high they can bounce. It’s great exercise and much more entertaining than a trampoline. Please note socks are required to play on the pillows and they cannot be used when wet. If you thought having a car full of sand and buckets and spades was just for beach holidays, think again. 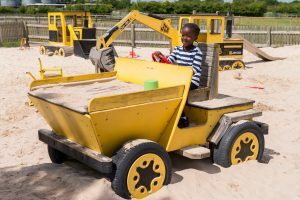 Mead Open Farm’s sand and water play area – called Shaggy’s Cove – offers a taste of desert island beach not far from land-locked Leighton Buzzard. Children love to dig and build in sand, and when you add water to the mix, it’s the perfect recipe for hours of entertainment! Pirate-themed Shaggy’s Cove features a water pump, bamboo channels for water to pour down, buckets on a pulley and lots and lots of sand. We provide buckets and spades – you provide the creativity! Dig, build and play! Digger Village is a fantastic child-friendly construction site for you to discover on your day out! Climb into Dina Digger and Donny Dozer, pretend to drive Dusty Dumper and Edgar Excavator or there is plenty of sand to push around with the six mini-diggers. With buckets and spades to build sandcastles with too, it’s just like being at the beach! 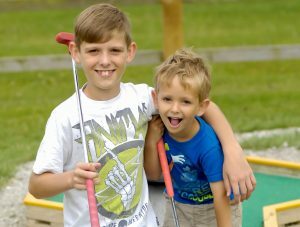 Challenge your friends and family on our 9-hole Crazy Golf Course, with mini slopes and even a swirly tower. Clubs and balls are available at the Paddock Kiosk next to the Go-Karts. Crazy Golf is included in your entry fee at Mead Open Farm. All aboard! Daily from April until September (weather permitting), join a fun Tractor & Trailer Ride around Mead Open Farm. Often tipped as one of the most enjoyable activities, make sure it’s on your ‘must-do’ list for your day out! 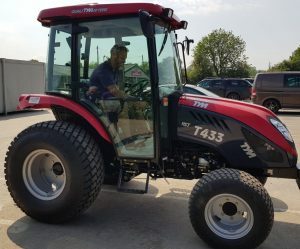 With live commentary provided by the farmer who is driving the tractor, sit back, hold on tight and see how many different animals you can spot in the fields. Towering 20ft high, this unique and exciting High Ropes Course provides a birds’ eye view of the Farm as you clamber, balance and swing your way around the course. Plus, with a lower level Sky Tykes course for tiny tots, the Sky Trail and Sky Tykes courses provide an experience for the whole family to enjoy – and it’s all included in the admission price! Please note: Sky Trail is dependent on weather and has flexible opening times depending on the day and time of year. Term time: 12:00-12:30 & 4:30-5.15 and Weekends: 11-12:45 & 1.45-5 Height restrictions apply: Sky Trial mini tykes is maximum 1.2 metres. Sky Trail is 1 metre minimum height (accompanied) and 1.2 metres minimum height (unaccompanied). Please wear closed-toe shoes when you visit as these must be worn on the Sky Trail and Sky Tykes courses and we don’t want anyone to be disappointed! 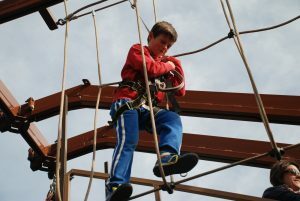 Please note: Giants Rock Climbing Wall and Sky Trail and Sky Tykes High Ropes Course is open from February to October. Can you get to the top of Giant’s Rock? Scale the huge children’s climbing wall, measuring over 24ft high, on your day out. it’s a must for all young rock-climbing enthusiasts! Challenge your friends to race the clock and see who can get to the top first! Please note: check the Weekday or Weekend Timetables for opening times as Giant’s Rock is dependent on weather and has flexible opening times depending on the day and time of year. Term time: 12:00-12:30 & 4:30-5.15 and Weekends: 11-12:45 & 1.45-5 Please wear closed-toe shoes when you visit as these must be worn on the Giant’s Rock climbing wall and we don’t want anyone to be disappointed! 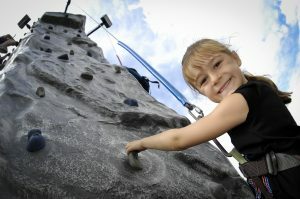 Please note: Giants Rock Climbing Wall and Sky Trail and Sky Tykes High Ropes Course is open from February to October. It’s a fun-packed day out for kids offering loads of different environments for children to play, swing, climb, balance, slide and ride! Come and see Bedfordshire’s favourite children’s farm for yourselves! Giants Rock Climbing Wall and Sky Trail and Sky Tykes High Ropes Course are open February Half Term until the end of October *weather dependent.